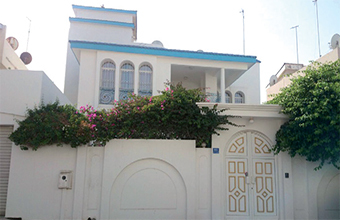 The villa is tucked off the main road near the American Embassy and within easy distance of an array of restaurants, supermarkets and a school. According to its owner, the semi-furnished gated property, which has a total land area of 550.4 sq/m, is ideal for large families as it is both spacious and functional. The property has elegant tiles and carpets. The ground floor features a large living room and dining area, a large kitchen, a guest closet and a guest bedroom. There is an outdoor kitchen for heavy-duty cooking and entertaining. There is also a maid’s room. The first floor includes another hall and four bedrooms. Every room features built-in wardrobes and ensuite bathrooms. The master bedroom also boasts a balcony overlooking the shaded swimming pool. There is a double garage for tenants and visitors can park nearby.